9,000 lb. capacity Rolling Jack for AR44018AR only. RJ9S rolling jack features air/hydraulic operation and comes standard with (4) 3″Stack Adapters for all 44018 four post automotive lifts. Broaden your service revenue with easy access to brakes and wheels from underneath four post lifts. 9,000 lb. 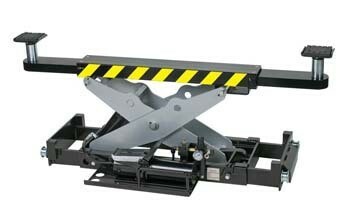 capacity rolling jacks features adjustable width, low vehicle drive-over clearance, stackable height extensions with built-in storage rack and factory installed and protected filter lubricator and regular.